New items are available in Parker's online store and all t-shirts are 25% off until Wednesday, Dec. 14th. We are happy to announce that Parker will be performing at this year's Americana Music Association Honors & Awards Show. Other Performers include Jason Isbell, Lucinda Williams, John Moreland, The Lumineers, Alison Krauss and many more talented artists. You can watch the show live at http://www.npr.org/music/. 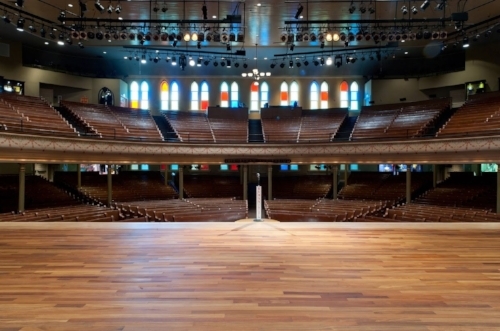 It will also be broadcast on SiriusXM’s Outlaw Country and Nashville’s WRLT, WSM and WMOT. If you missed Parker's performance on CONAN check it out HERE! Parker's song "Heaven Sent" has been included in NPR Music's 100 Favorite Songs of 2016 (so far) playlist. On Tuesday, May 17th Parker's tour van was stolen from his hotel near the airport in Minneapolis. Inside the van was a lot of musical gear and merch (CDs, Vinyl, t-shirts). The van was a white 12-passenger 2007 Chevy Expedition. It has Oklahoma plates...and now, a smashed window. If you live in the area and have any info pertaining to this theft please contact: jon@slipshodmusic.com. We are thrilled to announce that Parker's album, The Very Last Day, has been nominated for Album of the Year by the Americana Music Association. Other nominees are: Jason Isbell, Lucinda Williams, and Chris Stapleton. Check out Parker performing "The Very Last Day" & "Pining" in-studio at Nashville's Lightning 100. Watch Parker perform "The Very Last Day" for Garden & Gun's Back Porch Sessions at Willie Nelson's ranch in Luck, TX. Parker is hitting the road this spring in support of his new album, The Very Last Day. Check out his tour dates below to see if he'll be playing near you. Parker's new album, The Very Last Day, is out now! Just announced: Parker will be performing at this year's Luck Reunion at Willie Nelson's ranch on March 18th. Other performers include: Willie Nelson & Family, Jenny Lewis, Lucius, Blitzen Trapper and more. Parker's forthcoming album, The Very Last Day is now available for pre-order. Every pre-order in the artist store and iTunes comes with an instant free download of "Pining". Special merch bundles available at Parker's online store. The Very Last Day is out on March 25th. Entertainment Weekly has premiered the first single, "Pining", off of Parker's upcoming album, The Very Last Day.